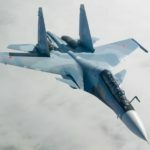 New and seemingly real footage of a Russian fighter banking hard toward a U.S. Air Force F-15 during an intercept that was likely over the Baltic Sea has surfaced online. In the footage, a Russian Air Force Su-27 “Flanker” can be seen banking directly into the F-15, forcing the American pilot to match the maneuver in order to avoid a mid-air collision. It’s unlikely that this video is of a recent intercept, as the last time U.S. Air Force F-15s were deployed in support of the Baltic Air Policing mission was December of 2017. It’s unclear why this footage found its way to the internet now, but watching it serves as a stark reminder than American and Russian aircraft are regularly engaged in an uncomfortable mix of aerial professionalism over international waters and aggressive behavior intended to intimidate. The United States has repeatedly called Russia out for their frequent “unsafe” intercepts of American aircraft, which are often unarmed reconnaissance flights like one intercept that took place earlier this week. Russian officials, however, have been historically dismissive of said claims, sometimes even suggesting the problem is American pilots lacking nerve. What do you think? Is this sort of behavior just a matter of fighter boys being fighter boys? Or is this a lack of professionalism of the sort that could create an international incident?